A key focus of the Food Safety Modernization Act, as well as a practical, immediate concern for food industry producers on a daily basis, is allergens. From incoming raw materials to line and cleaning verification considerations, allergen concerns abound in modern processing environments. In a recent issue of Food Safety Magazine, Michael Cramer took a look into the realities of allergens and what the food industry can do to become “zealots for the prevention of allergen cross-contamination and mislabeling to protect consumers, prevent serious allergen-related hospitalizations and reduce the number of allergen-related recalls. ” You can check out the full article HERE. 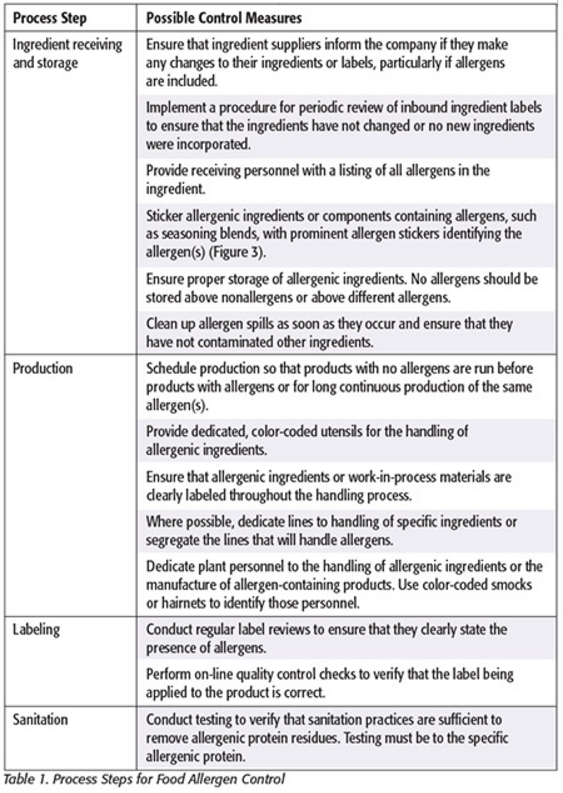 Also included in the article was the helpful graph below that details numerous process steps to consider in your management of allergens. In addition to the training and educational needs that Cramer advocates for in the article, know that Nelson-Jameson continues to assemble a full program of allergen focused products to help you in your processes. From color-coded products to allergen-specific testing products, we’re here to address your allergen program requirements.